It is hard to believe almost two years have passed since I took command of US Coast Guard District Thirteen in the Pacific Northwest. While my Change of Command and Retirement after 34 years of service is upon me, I wanted to share with you my observations about the state of “our” maritime community. First and foremost, I could not be more proud of the dedicated and heroic work the men and women of the Coast Guard do each and every day in our very challenging environment. From the outer Pacific Coast, up the Columbia and Snake River systems, through the Straits of Juan de Fuca, into the Puget Sound, and across the rivers and lakes of Washington, Oregon, Idaho and Montana - they stand the watch and do it incredibly well. Second, this region is all about the maritime. All of the work you perform on the water and along the waterfront, in distant waters, and in support of those that put to sea is phenomenal and has an incredible economic impact on our Nation. You are, much like your Coast Guard, part of the fabric of the Pacific Northwest. However, it is clear more needs to be done to tell the maritime story in this region, as too few people truly understand its importance. For the last two years I have been amazed at how quickly the understanding and appreciation for the impact maritime activity has on this region fades as you move away from the waterfront. Thanks again for the warm welcome you extended me when I arrived, and how you always embrace the Pacific Northwest Coast Guard team. I have worked closely with many of you in our local communities, industry, government and the private sector over the last two years, and I am proud to call you my friends. We have been brought together by business and we have been bonded by a special passion for the sea. 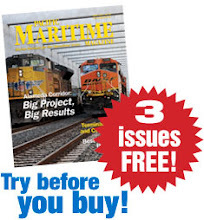 In the opinion piece I wrote in this magazine at the beginning of my tour I covered several topics, such as the tremendous value that maritime activity in the Pacific Northwest brings to not only our region, but to the country and the world. I described the important role the Coast Guard plays, and how essential it is to collaborate with industry, elected officials, state, local, federal, international and tribal partners. I also talked about Safety. It is the key to everything the Coast Guard does, and it must be part of your operating culture as well. Our waters are unforgiving and we must all be rigorous in our attention to detail and our unwillingness to compromise - we have all lost too many shipmates, friends and family to the sea. The Pacific Northwest is home to the third largest container port (Seattle/Tacoma), the second largest grain export complex (Portland/Vancouver/Seattle/Tacoma), the largest vehicle import operation on the West Coast (Portland), the largest ferry system (Washington), a large portion of our Navy’s fleet (Bangor/Bremerton/Everett), and a large, complex international maritime border. This region is also home to one of the largest and most advanced commercial fishing fleets in the world. These ships harvest locally off the coast of Washington and Oregon, as well as in the distant waters of Alaska and in the Bering Sea. The wonder, beauty and bounty of this region is tremendous and is equaled only by extremely tough weather, harsh coastal conditions and treacherous breaking bars along the coast. Collectively we must work to ensure the safety, security and viability of the waterways in the Pacific Northwest. For the Coast Guard there is no shortage of work as we serve the public, and all of you, each and every day. Last year we conducted 1,631 search and rescue cases, saved 184 lives, assisted another 2,390 people in distress, and saved property valued at over $8 million. While some Coast Guard members are heralded for their heroic rescues, or critical response and prevention actions; others are hard at work behind the scenes, in concert with all of you, to ensure that maritime activity is conducted safely and securely. In 2012, we conducted more than 2,000 vessel examinations and 530 facility inspections, all with an eye towards safety, security and environmental compliance. These efforts are critical to maritime business and commerce. In meeting many maritime professionals at Harbor Safety Committee meetings, professional seminars, industry meetings, and in discussions with elected leaders, there are a wide range of plans and ideas that may significantly increase commercial traffic in our ports, on our rivers and along our coast. It is also apparent there is concern about what these potential changes may mean. As many of you know, the Coast Guard stands the watch daily overseeing our region’s precious waterways. Whether it is in our regional Command Centers, at our Stations along the coast or from our Cooperative Vessel Traffic Service (VTS) here in Seattle; we are on watch and ready. VTS Puget Sound celebrated its 40th birthday in the fall of 2012, and the men and women who stand the watch monitor the Straits of Juan de Fuca and Puget Sound, an area of more than 3,500 square miles. VTS Puget Sound is the nations’ only Vessel Traffic Service working cooperatively with the Canadian Coast Guard to protect our waters and allow traffic to travel seamlessly in our shared and challenging waterways. The Coast Guard’s partnership with Canada is extensive and covers the full spectrum of our various mission demands - Aids to Navigation, Search and Rescue, Pollution Prevention and Response, and National Defense to name a few. We work together daily and we recently regularized “Shiprider” operations under a regional agreement I signed with my counterpart from the Royal Canadian Mounted Police (RCMP). Prototyped several times since 2005, and signed into law last year, the goal of “Shiprider” is to make the border transparent for law enforcement purposes. RCMP Officers and USCG Officers will work together on the same boats to enforce the laws of both Nations and deter, disrupt and apprehend criminals who look to exploit our maritime boundary. Keeping the waterways in our region safe and open for navigation is also one of the Coast Guard’s prime responsibilities. Two years ago the derelict vessel Davy Crocket began to spill oil into the Columbia River and required a very large, complex response led by the Coast Guard. It was difficult, it took a long time, and it was very costly. The take away from that experience is nothing new, but something we must all remember – these waters belong to all of us and we have a shared responsibility to protect them. In the Davy Crocket response the Coast Guard teamed with Federal, state, local and tribal partners to direct the effort that resulted in the recovery of approximately 33,491 gallons of oil, 4.5 million pounds of steel, and 841,796 pounds of debris. To do this type of work, to do it well, and to do it safely requires incredible professionalism. Everyone approached this work with skill, precision and passion, and I ask each of you to bring that same level of professionalism to everything you do in the maritime. We must always grow our collective expertise as professional mariners, maritime management experts, policy makers and law enforcement officers – together we can make the maritime safe and ensure these waters remain productive for generations to come. That said, I cannot divorce myself from the fiscal challenges and uncertainty the Coast Guard faces today, as I can only imagine many of you face. We push ourselves every day to be creative, shepherd the resources we have and meet our full array of mission demands. My job is to make sure we remain ready to meet the most urgent of mission needs, that we continue to train our people, and that we always strive for excellence. Given our limited resources, I must manage risk and allocate our ship days, patrol boat hours and flight hours to those activities that address the highest risk we face on and around the water. As I look out of my window here in Seattle, I see our aging fleet of large ships at Pier 36 - they are indispensable to our Nation’s maritime safety, security and environmental stewardship, and we must recapitalize the Coast Guard to ensure our ability to serve the Nation in the future, while at the same time meeting the many mission demands we have today. This is a very tough balance, and it must be done with great planning, a clear eye to the future and strong support for the Coast Guard. As I said last time, strong relationships, collaboration on the toughest of issues and honest dialogue have long been the trademark here. This has been my personal experience, and has helped move several key initiatives forward over the last two years. But, like most things, much more can, and should be done. The Pacific Northwest maritime story needs to be told, and it is imperative that we protect the waters of the “Great” Pacific Northwest - they are our highways of commerce, the fertile grounds that feed us, the source of much enjoyment, part of our cultural DNA and absolutely critical to the economic vitality of our region and country. Thank you and Semper Paratus –Always Ready! Rear Admiral Keith A. Taylor, Commander of the Thirteenth Coast Guard District headquartered in Seattle, Washington, is responsible for US Coast Guard operations covering 4 states, more than 4,400 miles of coastline, 600 miles of inland waterways, and a 125-mile international border with Canada. Rear Admiral Taylor is a career aviator with over 4,700 flight hours. He holds a Bachelor of Science degree with honors from the US Coast Guard Academy, a Master of Science in Industrial Administration degree from Purdue University and a Master of Business Administration degree from the Massachusetts Institute of Technology where he was a Sloan Fellow.